The fluorescein test is very important in diagnosis of corneal diseases. Is our best friend that accurately describes the size and the depth of the corneal lesions. 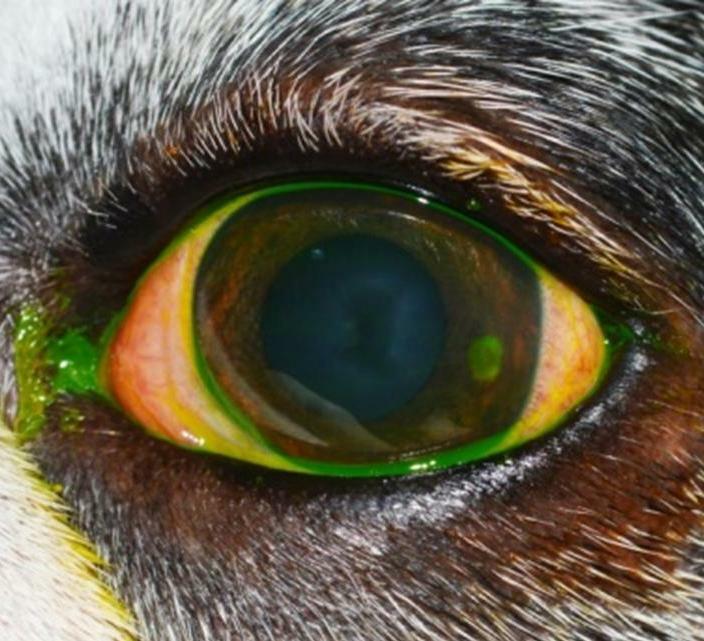 If the fluorescein test is positive exclude primarily a foreign body (from the conjunctival fornix or from the internal surface of the third eyelid) and then examine using the loupe, the edges of corneal lesion. If is an area of loose of the epithelium at the periphery of the lesion, looking like an “opened book (Figure 1, Figure 2 and Figure 5) your patient has indolent corneal ulcer. 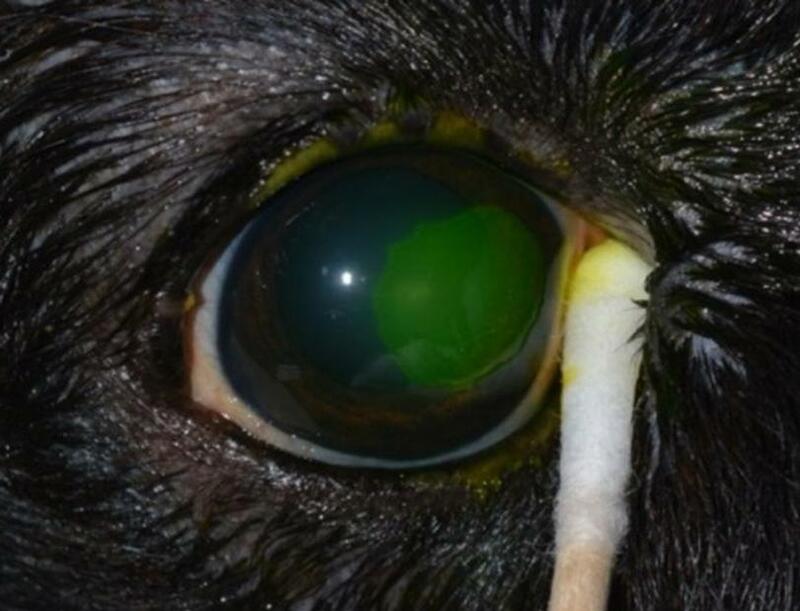 The first step in the treatment of indolent corneal ulcer is the debridement of the denude epithelium using a cotton-tipped applicators (Figure 2), scalpel blade or Alger Brush® (Figure 3). 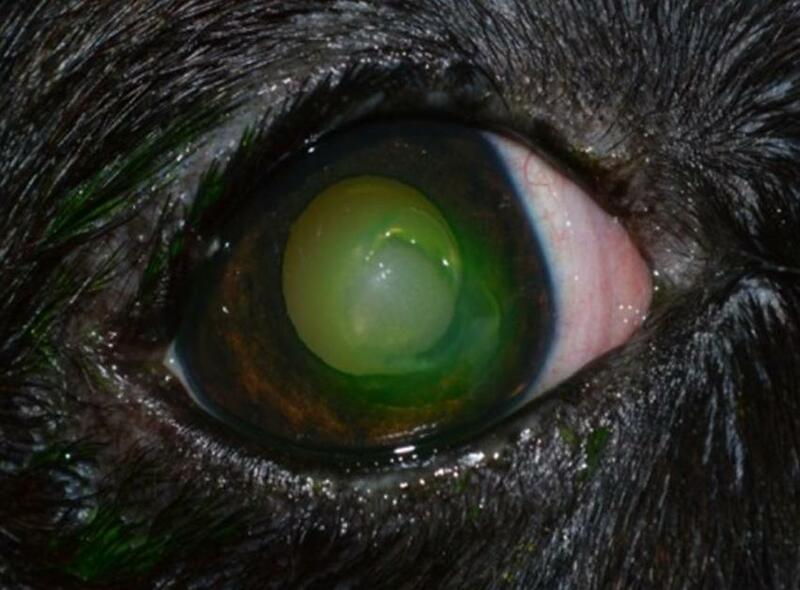 Local anesthesia of the cornea using Benoxi® will allow you to perform debridement. 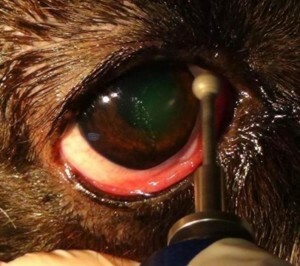 Using cotton-tipped applicators, the loose epithelium is removed using gentle lateral and circular movements. 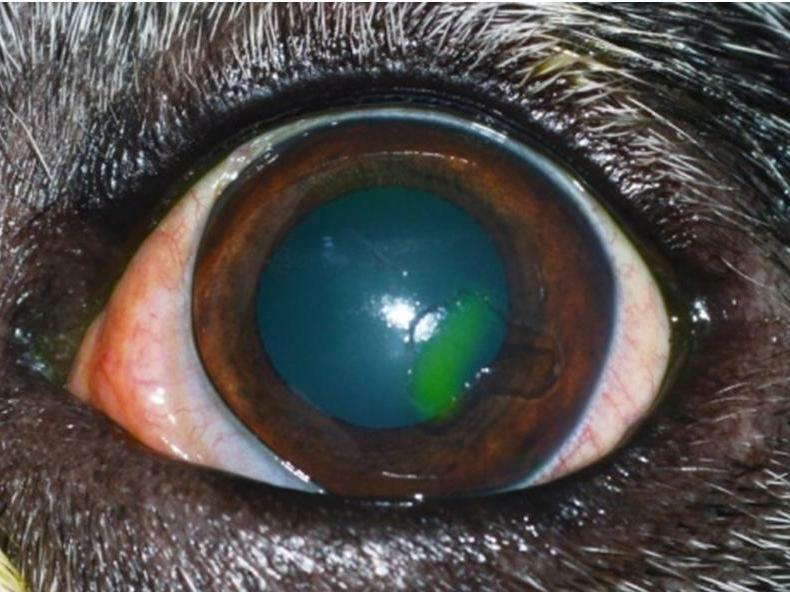 Debridement using a surgical blade is easily performed doing lateral movements, holding the blade’s sharpen edge perpendicular on the corneal surface. 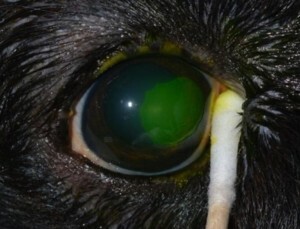 The burr of the Alger Brush® device is faced towards the edges of the corneal ulcer and debridement is performed in a circular movement, following the limit between the ulcer and the healthy cornea. 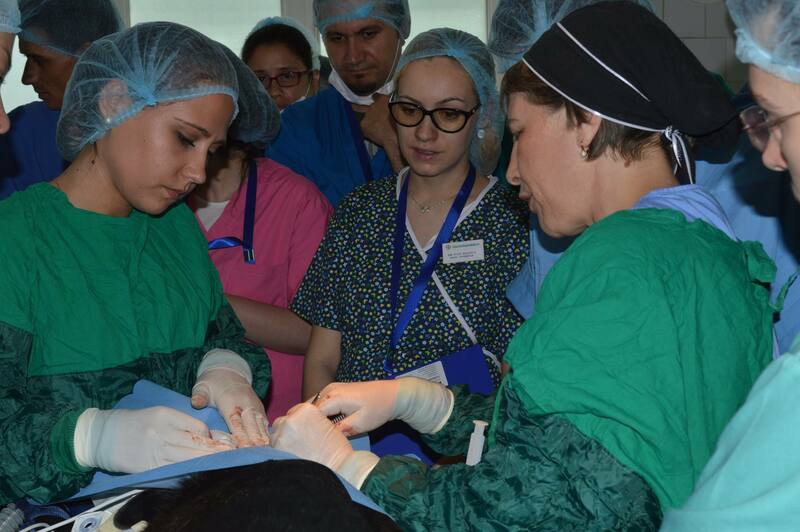 The small burr of the device quickly removes the epithelium so that the surgeon’s hand is laid on the periorbital area for support, to avoid accidents. Throughout debridement the corneal surface is flushed continuously using saline. After performing the debridement of the indolent ulcer, the lesion is significantly bigger than the initial one (Figure 6), and in some cases, the anterior epithelium is completely removed. Indolent corneal ulcer after debridement can be healed ad integrum (Figure 8) in 5-10 days or, in some cases, we need to perform many debridements. 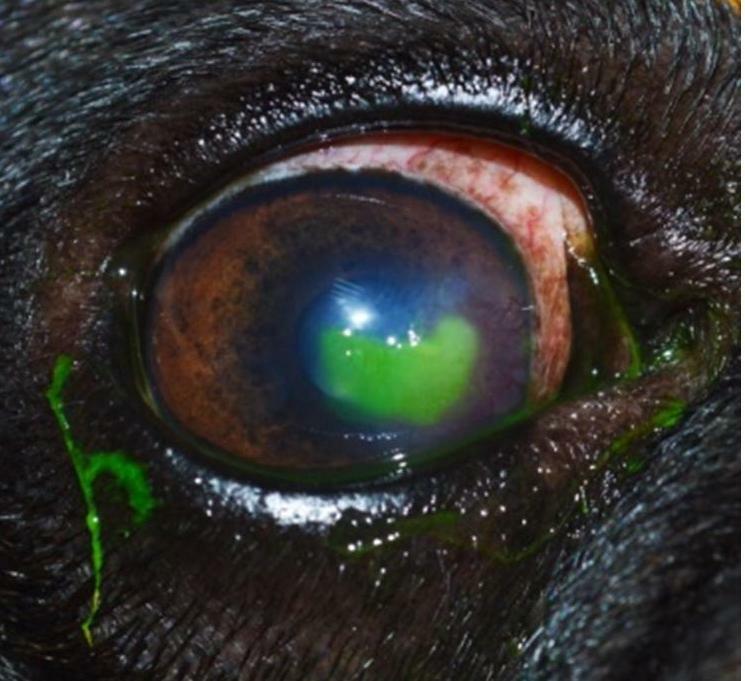 That’s why rechecks should be performed each 5 days after debridement and fluorescein test and reexamination with the loupe is mandatory. She is one impressive woman…. person with capital letter “P”. 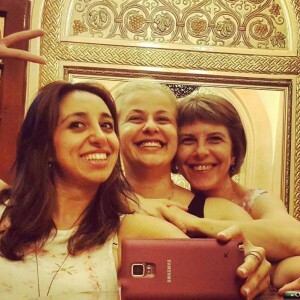 I am writing this article from the bottom of my heart and with big pleasure that I can do this. I saw her for the first time on AMVAC annual congress , then one guy pointed her out and told me “ this is our professor of ophthalmologic in the University ,she is wonderful lady”. I saw how many people went to her and spoke and hugged her. 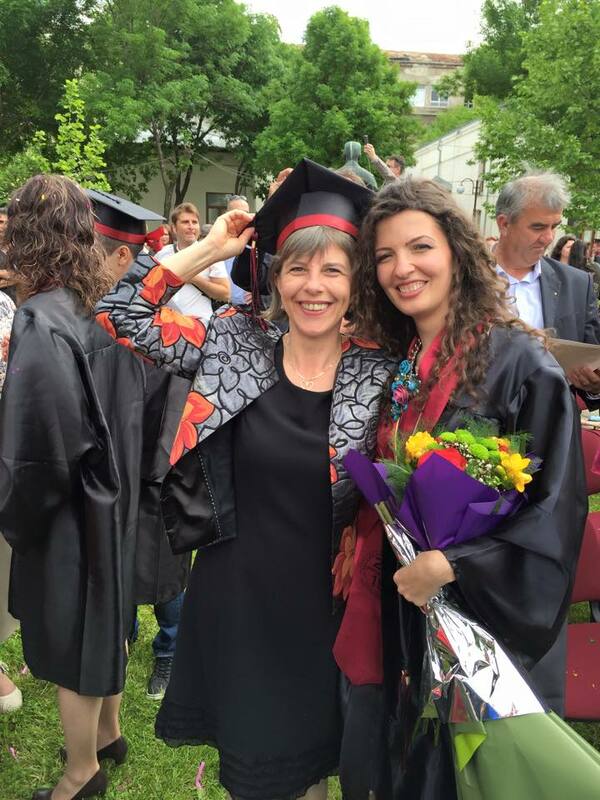 Some part of me was jealous that Romanians have professor like her. 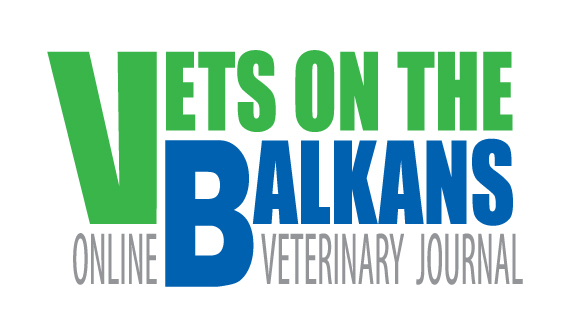 At the next meeting with her , we already were talking about PhD opportunities and she invited all Bulgarian vets who are interested in ophthalmology to visit and stay with her at Veterinary Faculty in Bucharest, Romania. Impressive … I have never seen something like that. She is open, so lovely person, ready to do everything for her colleagues from foreign country. She is born 11october 1967 in the city of lernut, Mures county. 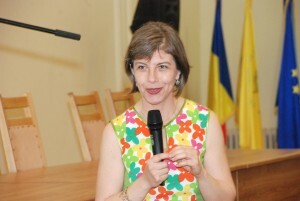 She graduated in Bucharest Faculty of Veterinary Medicine, class 1997. 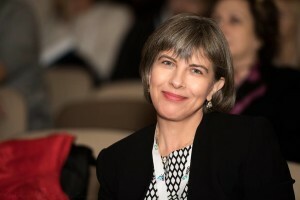 She begins her teaching activity in 1998 at the Necropsy Diagnostic Department of the same faculty, under the guidance of Associate Professor Dr Anca Lungu. 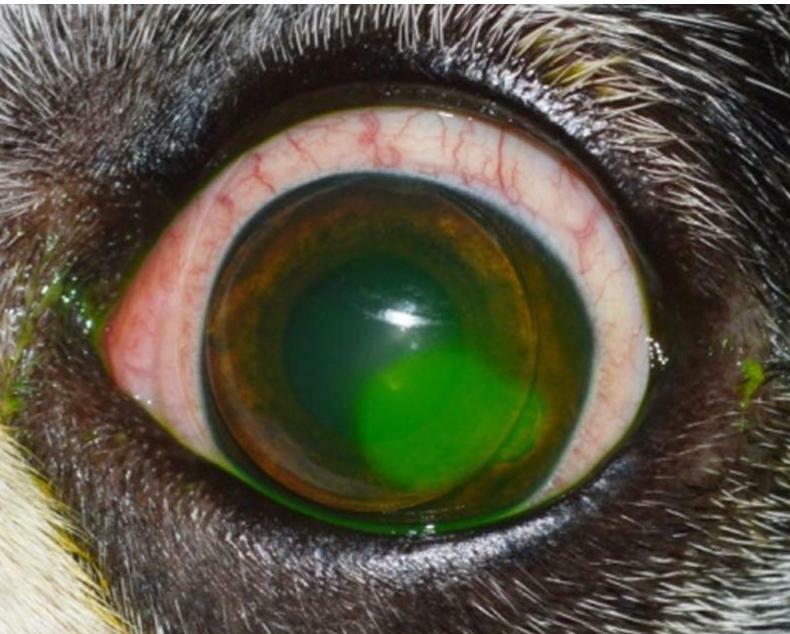 She continues her teaching activity in the Surgery Department where in 2005, under the guidance of Professor Dr Ion Miclaus, she presents her PhD thesis entitled “Clinical aspects, morphs-pathological changes and treatment in lens pathology in dogs and cats” . 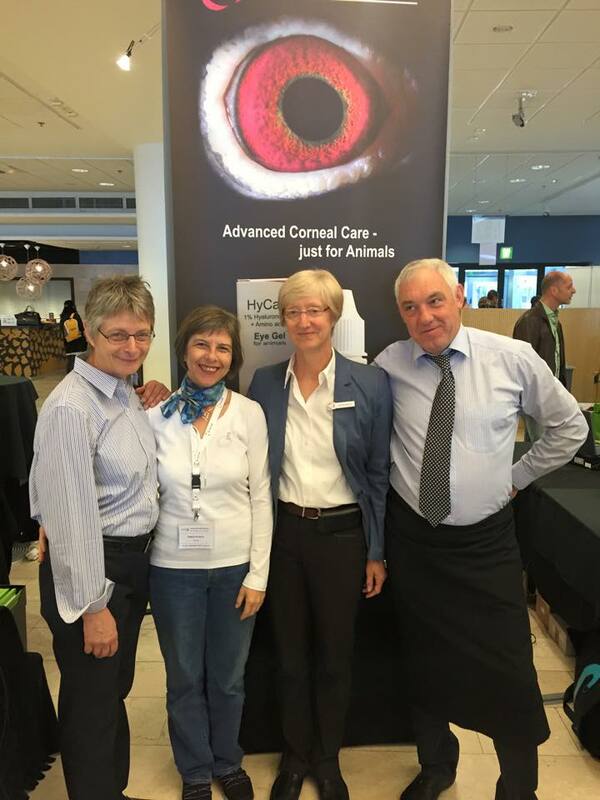 The published scientific papers and books are mainly in the veterinary ophthalmology fields. 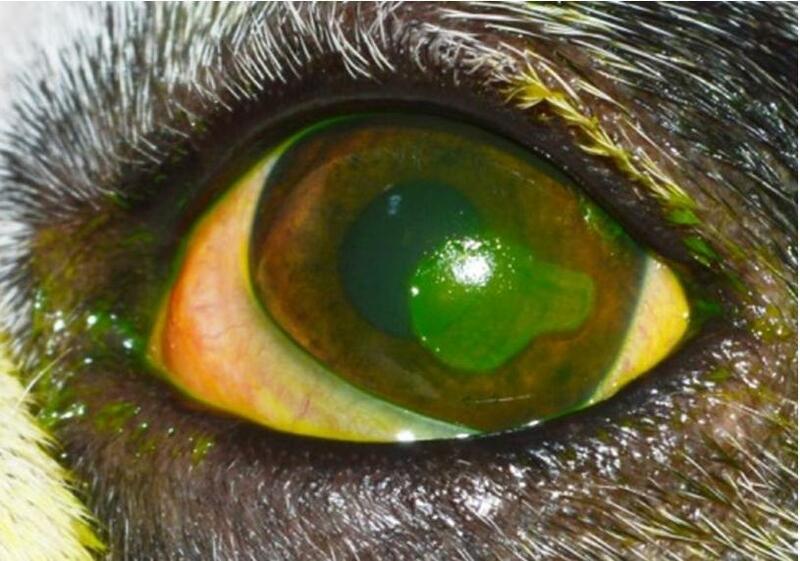 These include clinical research, comparative therapies , morphological and microscopes aspects of different lesions of the ocular globe and its annexes. Invited to International and Romanian scientific meetings as a speaker, she proposes subjects that answer veterinary practitioners questions and she brings the most up-to-date information regarding the diagnosis, ophthalmological surgical techniques or comparative therapeutic plans. As a president of the Romanian Association of Veterinary Ophthalmology she is the initiator and the organizer of specialized workshops and conferences. She is perfect example of excellent professional. She is model for good job and if I have half of her way of working I will be proud . 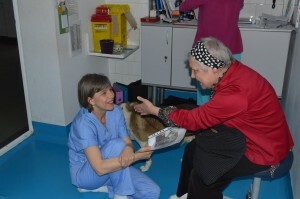 When I saw her for the first time at her work place, in the faculty clinic… she is like a wind. She is working and around her have a lot of students, PhD students. All of them love her. She is born to be a teacher. If every country has one vet like her we all will live in better world! We all can learn from her , not only ophthalmology, we should learn how to be better people , how to help and support each other, how to share our knowledge and experience, how to share our possibilities with the other people! RESPECT and REVERENCE Madam Ionascu !!!!!!!!!! 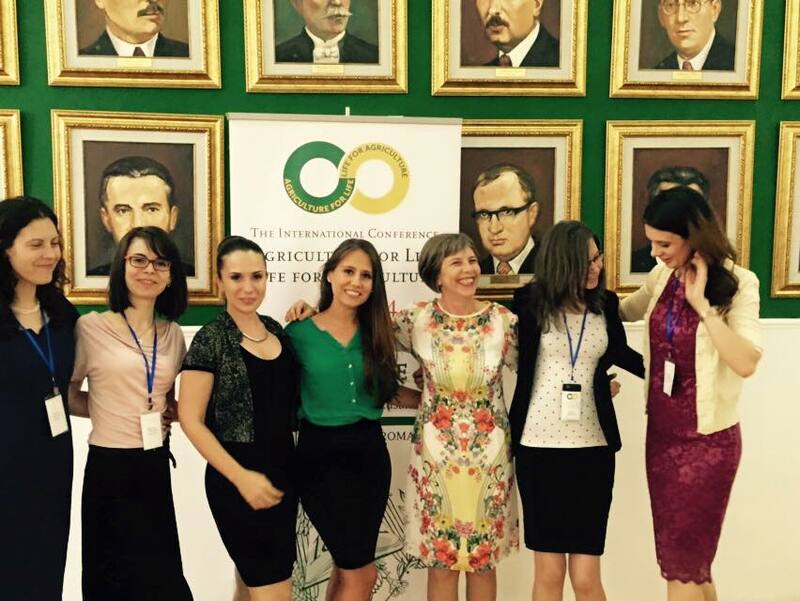 We all are proud to be part of your life and professional way!